Uncertainty is one of those low budget independent films starring Joseph Gordon-Levitt, the former star of Third Rock From the Sun who didn’t take the money and run, but took the money and decided to dedicate himself to making interesting and challenging movies since he probably doesn’t even have to work for the rest of his life if he doesn’t want to (or so everyone says, I wouldn’t know myself). 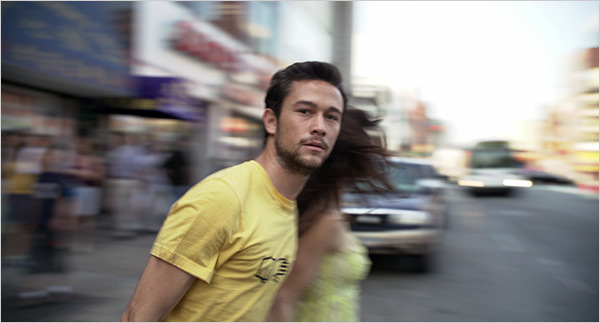 This basically means Uncertainty is one of those films that, though it doesn’t really work, is worth seeing (even if only on cable or DVD) for no other reason than it stars Gordon-Levitt, who does his usual excellent work here. Gordon-Levitt, along with Lynn Collins, play a couple who one day, on a whim, decide to take off in different directions on a bridge. The conceit is that one thing happens if we follow Gordon-Levitt and another happens if we follow Collins. That’s about it to the conceit, though; it doesn’t seem to be like the movie Run, Lola, Run, which tries to say something about chance and free will. It’s just two stories for the price of one. One story tells what happens when the couple finds a phone in a cab and tries to return it by calling numbers listed. It turns out this phone is involved in a scandal of such epic proportions that people are willing to kill someone in broad daylight in front of hundred of witnesses to get it back. This is a great premise and it starts out so well; but it then makes one of those no turning back mistakes. Once the couple don’t report it to the police, the story stops working and there’s no place believable for it to go (it comes with a very hard to buy scene in a police station that seems to have only one police detective on duty, out to lunch very conveniently for the story, and in which a desk sergeant could care less when two people come in to report a murder—and I have the deed to the Brooklyn Bridge in my pocket). When the couple become stupid and try to negotiate selling the phone (to people, remember, who will kill someone in broad daylight in order to get the phone back, which means that even if these two get the money, the phone’s owners will still hunt them down and kill them), the couple loses sympathy and it’s hard to care what happens to them. The ending is ridiculous; they still don’t go to the police, but throw the phone away—I give them two days to live. The second story is a relationship study of the couple when they go to a barbeque at Collins’ family. Her mother disapproves of almost everything that Collins does and though polite, obviously doesn’t approve of Gordon-Levitt. This is a perfectly fine little chamber piece, but it doesn’t rise above what it is and never really grabs one. The script and direction are by Scott McGehee and David Siegel. The direction is excellent backed by the grainy look very popular in indie films (they also did the wonderful film The Deep End with Tilda Swinton a few years back). The directors know how to keep the story going and work well with the actors. If only the script were as strong.